Good Morning! The blog group that I belong to has a monthly challenge and this month it was my turn to host and for this month's challenge I asked that we make 'Christmas in July' cards. And as many of you know clean & simple cards are my very favorite cards so I thought it would be neat to make our Christmas cards clean & simple, so here's my CAS Christmas card for this month's challenge. 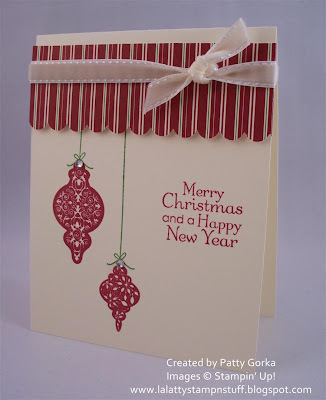 I'm submitting my card for this week's challenge over at the Paper Players Blog and their challenge was to create a Christmas card. I'm also excited to share some exciting news with all of my blogging friends and followers. I made the design team on the 52 Christmas Card Throwdown blog. I'm so excited to be working on the DT and I just love Christmas cards! I used a recently retired stamp set called Tree Trimmings. I simply stamped the ornaments using raspberry ripple ink and then I stamped the ornament string using gumball green ink. My sentiment was stamped next, again using raspberry ripple ink. Then I decided to add my designer series paper with some vanilla ribbon tied around it. My dsp was punched along the bottom using my scallop border punch and it was placed on my card using dimensionals. For a finishing touch I added a rhinestone gem at the top of each ornament and just below the stamped bow. And that's about it for my card, super easy and quick too. This would be a great card to produce for your holiday cards! Have a great day and I'll be back later today with another card. If you would like to see the other cards the ladies in my blog group made I'll post their links below. Thanks for stopping by! Very Pretty Card Patty! Thanks for a fun challenge this month! 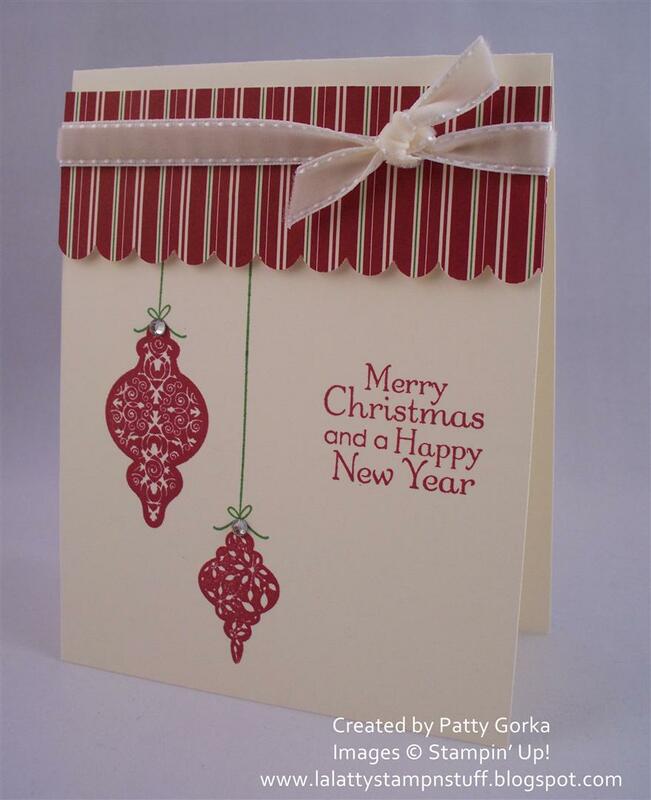 Love your Christmas in July card, great clean design! OF COURSE... your card ROCKS!!!. Patty you're a natural at CAS. Gorgeous card!!! and so simple!!!. Great challenge as well you made me add another Christmas card to my started pile in January.I only have 14 and I need around 50. I better continue with this!!!. Thanks. So pretty! LOVE the bright green ribbon stamp! This is FABULOUS! Great challenge! I love the scallops at the top. Very pretty! Great card, Patty! Thanks for the terrific challenge. Beautiful card. The scallop border adds a nice touch to the CAS.